This time of year a red deer stag's fancy lightly turns to thoughts of love, or at least procreation of the species by impregnating as many of the graceful does as he can gain control of. All through the evening, late into the night, and again in the hours just before dawn they bellow their challenges and assert their magnificence with huge hormone fueled roars which echo and reverberate around the farm, ricocheting back from the dense walls of the trees until the fields begin to resemble a war zone full of sound bombs. The chap above is an anomaly, he has a voice to compare with any of the other competing beasts but he seems to be entirely without horns. Who knows what accident of breeding or health has put our man at a disadvantage. 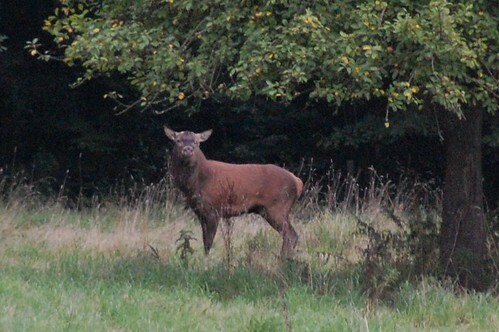 He seemed feisty enough when I took the picture, yelling his head off in the hope of picking a fight but I wonder how he fares with the females, who must take a full head of antlers into account before choosing a mate? It seems ironic then, that at the moment when mating is taking all their attention and all the deer are ragged with exhaustion from the long nights on parade that the hunting season starts at this time. We have been advised for this year that Mondays are the designated days for hunting within the forest and picnics and walks on these days are strongly discouraged. There are also special hunting days where whole areas are signed off limits for a day at a time to avoid accidents to civilians. Fine warnings for the townsfolk who come out for rejuvenating fresh air at the weekends, more difficult for those of us who live within the forest boundaries and cannot simply cease to exist for one or more days a week. The number of deer taken are limited of course, the forest is a National park, owned by the state and quite strictly regulated. 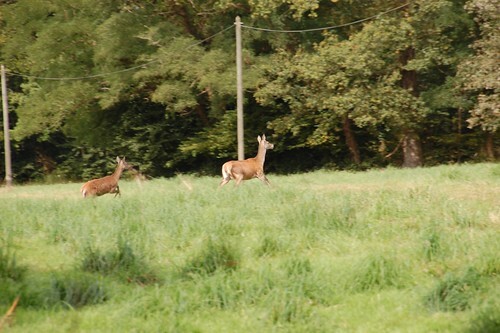 The hunters too are supposed to have joined local groups, undertaken training and follow rules of the hunt but it's not too comfortable to hear shots near to the house more or less any time between the end of September and the beginning of March. The hunters don't just hunt deer of course, but look for duck, rabbits, wild boar and other more recondite prey like coypu, badgers and foxes, just for the sport of it. Although responsible sportsmen are restricted from shooting with 100 metres of a dwelling I suspect few around here realise I'm in residence. Consequently, I'm going to keep lights on all night and light fires on Mondays even if they're not needed, just to give them a clue. And maybe I'll renew all the Chasse Interdite signs too.